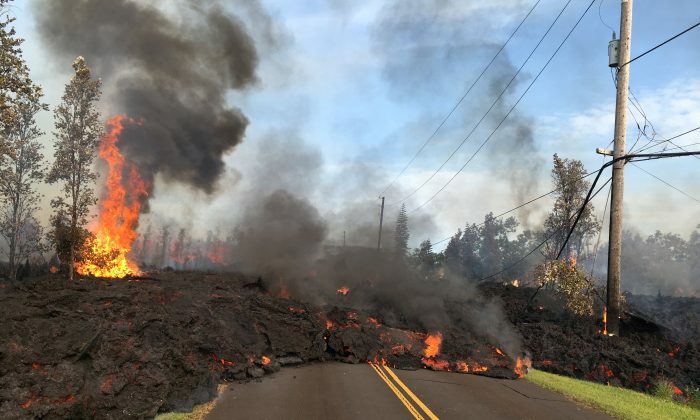 The most active volcano in Hawaii, Kilauea volcano has spilled red-hot lava and its fissures had emitted magma with 2 yards thick along the streets in Leilani Estates and Lanipuna Gardens areas in the eastern part of Hawaii's Big Island. There are 26 homes damaged and dozens of locals had been mandated to evacuate. The lava still continuous and more dangerous spills in the fissures threatening hundreds of locals, homes and infrastructures in the inland. The Civil Defense Agency said "Because of unstable conditions that involve toxic gas, earthquakes and lava activities, lines of safety can change at any time. The high levels of sulfur dioxide are a threat to all who become exposed." Residents of Leilani Estates were allowed to return to their homes on Sunday between 7:00 am and 6:00 pm to check on their properties and remove belongings.